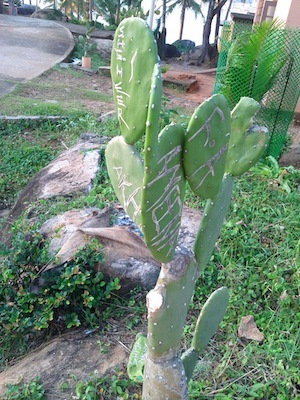 I’ve seen celebs try to talk sense into the junta, I’ve heard academics discussing white boards and pin boards at monuments so people can scribble on those rather than the walls, but this … this is the first time I’ve seen something like this and it’s all over the Hawah Beach area of Trivandrum’s Kovalam beach. Unbelievable! where singles go to … pray? 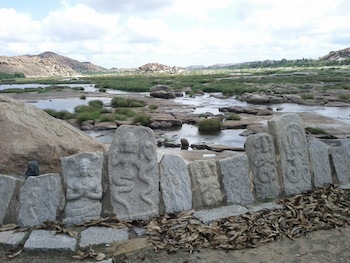 This is a shrine in Anegundi, Karnataka (across the Tungabhadra river from Hampi) where long-suffering parents who were worried about their still single (stubborn) kids came to ask the goddess for help. If you donated a statue in the image of your child and placed it just so, apparently they’d get hitched pronto. And the four of us single women took in this view and digested the tale and laughed.